An Arizona homeowner finds financial savings through solar installer Southface Solar Electric at a local home and garden show. Looking for a way to maximize efficiency and minimize electrical expense, this customer called in a special request for M250 Microinverters. While most people look to solar as an environmentally friendly alternative energy option, the financial savings of solar are an added bonus homeowners across the world simply can’t ignore. The residents of Goodyear, Arizona, are no exception. A local homeowner was looking for an upgrade to his home, and one that would benefit him both now and in the years to come. Knowing solar was the solution, the homeowner shopped around with different solar installers, but it wasn’t until he stopped by the Southface Solar exhibit at the local home and garden show that he learned how the Enphase System could provide him with the most efficient microinverter in the market. Hearing that the new M250 Microinverters were now available, this Arizona homeowner called his installer asking specifically for Enphase’s most advanced inverter yet. Plans were drawn, equip- ment was ordered, and Southface Solar began installing. Quality proven with an industry-leading 1 million hours of test- ing, the M250 Microinverter is engineered for high perfomance throughout the course of its lifetime. The high efficiency of the M250 paired with higher-power modules allowed the homeowner to generate more energy to run his daily household needs, offsetting his electricity bills by 88 percent. 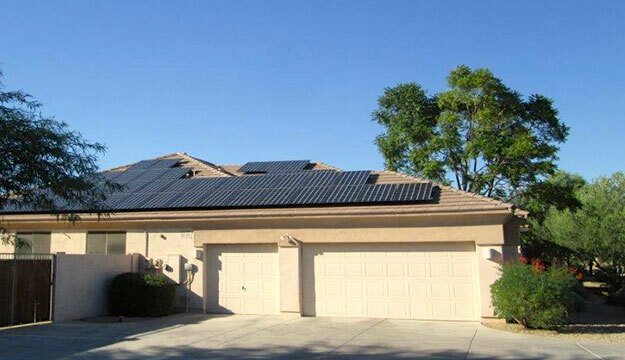 Southface Solar, Arizona’s premier photovoltaic system designer and integrator, serves the entire state of Arizona and focuses on designing desert-durable installations for their residential projects. Aiming to provide quality solar technology to households since its beginning in 2008, Southface Solar has chosen the Enphase System every step of the way. When we sell a system, we prefer to use Enphase over traditional inverters every time.